Covering spreadsheets, presentations, texts, drawings, databases and the equations editor, as well as other important concepts in LibreOffice, the guide updates the previous book for LibreOffice 5.2 with the features implemented up to the 6.0 release. As it’s an introductory text, some advanced topics were left out, and are to be addressed in the other specialized modules guides, such as the Writer Guide 6.0. This turns the Getting Started Guide into a light reading on all of LibreOffice’s most important features and concepts. “We are pleased to announce the release the new Getting Started Guide 6.0, bringing the contents closer to the latest version of the software. With this effort we also want to improve the documentation development process, and deliver the next update in much shorter time frame” said Dave Barton, member of the Documentation team. “We will begin the Getting Started 6.1 Guide project shortly” he added. “The Guides update has been a very long process and revealed issues especially with revision, which is a very time consuming task and hard to carry out. A delicate balance is necessary between contribution and revision. We would like to try a time-based release of the next guide” said Olivier Hallot, Documentation Team Coordinator. “We will announce new methods and tools to speed up the authoring and release of the Guides”, he added. The Guide was assembled using the techniques of the LibreOffice master document, a container of linked individual chapters, allowing the update of the chapters to be carried out automatically for the final document. The master document was then the source for exporting the Guide in PDF, EPUB and ODT formats for download. 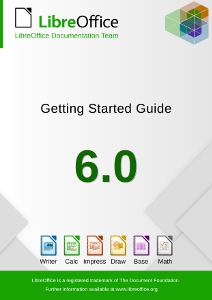 The Getting Started Guide 6.0 is available for download in the documentation website at https://documentation.libreoffice.org/en/english-documentation/getting-started-guide/ and the individual chapters and master document are in the TDF wiki at https://wiki.documentfoundation.org/Documentation/Publications#Getting_Started_with_LibreOffice . LibreOffice 6.0’s Getting Started Guide is also available as a printed book from Lulu, by Friends of Open Document Inc., an Australia-based volunteer organization with members around the world, which will be using profits from the sale to benefit the LibreOffice community.